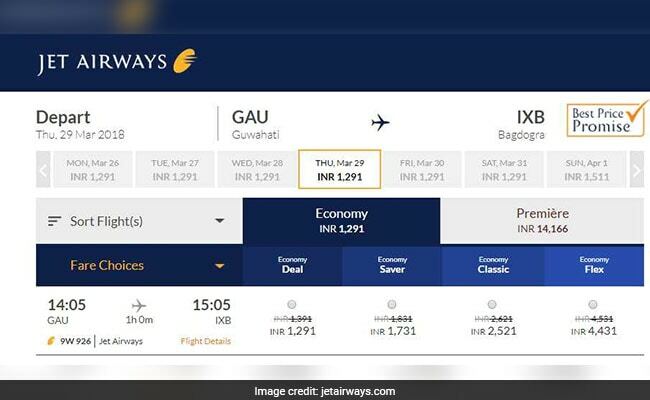 For travel between Guwahati to Bagdogra on March 29, a Jet Airways flight ticket is priced at Rs 1,291. Jet Airways' Holiday Specials sale is applicable on select booking classes. Jet Airways is offering 20 per cent discount on domestic flights until February 26. "Plan your travel with Jet Airways and book flights online seamlessly. With over 600 daily flights and 64 destinations worldwide, you can now explore our extensive network of domestic flights and international flights at best fares. Enjoy special offers on flight tickets only when you book on our website and mobile app," Jet Airways said on its website, jetairways.com. 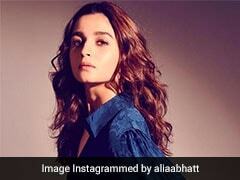 Earlier this offer from Jet Airways was supposed to end by February 23. 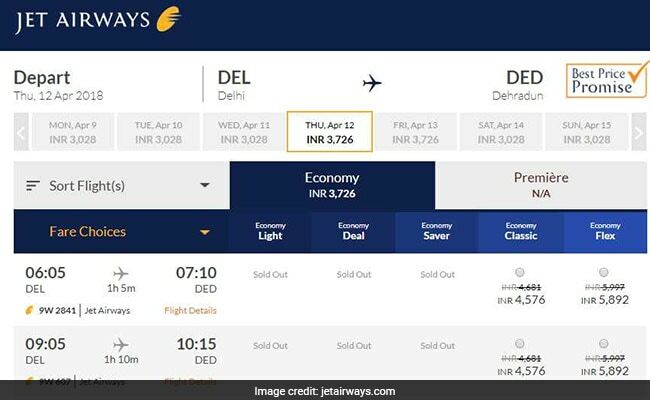 A search on the website of Jet Airways showed that a flight ticket from Delhi to Dehradun for travel on April 13 is available at a price of Rs 3,726. 1. 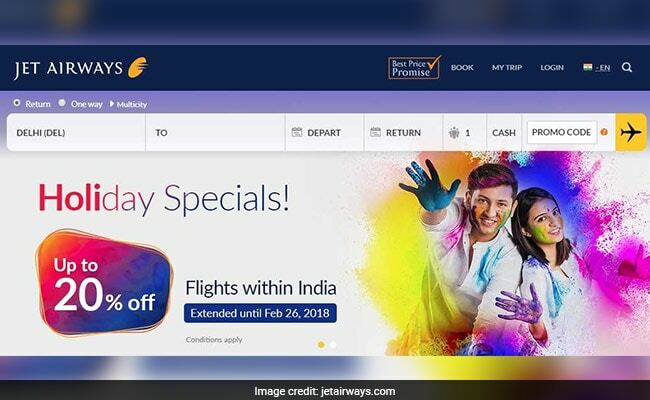 A 20% discount is applicable on base fare in premiere and 10 per cent discount is applicable on base fare in economy class on select Jet Airways flights within India, according to jetairways.com. 2. Jet Airways' Holiday Specials sale is applicable on one way and return journeys. 3.. Tickets must be purchased between February 17, 2018 and February 26, 2018. 4. The travel must commence on or before April 15, 2018. 5. Jet Airways fight tickets must be purchased a minimum of seven days prior departure. 6. Jet Airways' Holiday Specials sale is applicable on select booking classes: Economy - B and Premiere - P.
7. Child/infant discount, date change, flight change, refund charges, weekend surcharge, black out period, travel restriction and / or flight restriction will be applicable as mentioned in the fare rule. 8. Jet Airways reserves the right at any time, without prior notice to add, alter, modify, change or vary all or any of these terms and conditions or to replace wholly or in part, the above offer by another offer, whether similar to above offer or not, or to withdraw it altogether.